Cook together fresh rhubarb, sugar and water combined with strawberry gelatin in this rhubarb-berry jam. 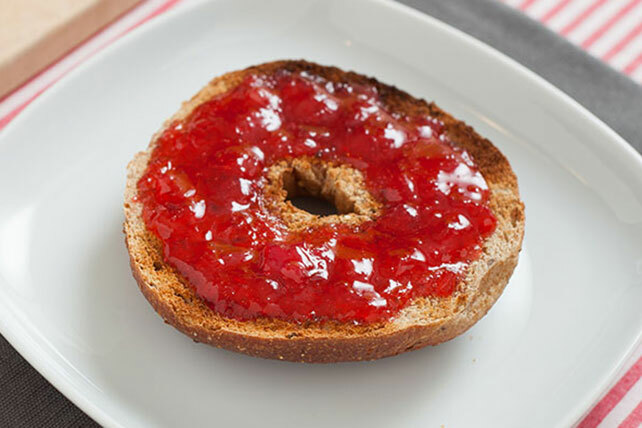 JELL-O® Rhubarb-Berry Jam is a great canning idea. Mix rhubarb, sugar and water in large saucepan. Cook on high heat 2 min. or until sugar is dissolved, stirring constantly. Reduce heat to medium; cover and cook until rhubarb is tender, stirring occasionally. Uncover; cook an additional 12 to 15 min. or until mixture is slightly thickened, stirring occasionally. Remove from heat. Add gelatin; stir until dissolved. Skim off any foam with metal spoon. Ladle immediately into prepared jars, filling to within 1/4 inch of tops. Wipe jar rims and threads. Cover with two-piece lids. Screw bands tightly. Turn jars upside-down. After 5 min., turn upright. Or, follow water bath method recommended by USDA. Cool. Store in refrigerator. Jam is best used within 1 month since it will become very thick with longer storage. Makes about 4 (1-cup) jars or 64 servings, 1 Tbsp. each.